Breaching hazardous levels of close to 400 PSI (Pollutants Standards Index), #SGHaze is upon us yet again. In a manner eerily reminiscent of the last time PSI levels breached 300 in 2013, entire streets were shrouded in a cloaking and choking grey. Brought about by the El Nino effects as well as the clearing of forests in the surrounding islands of Sumatra and Kalimantan by various parties, the rising pollution levels triggered emergency responses from both the Singapore Government and various organisations. This time around, we are much better prepared to handle the haze on a national level. For the first time here, authorities in Singapore have declared that all primary and secondary schools will be closed on Friday (25 September). Community Clubs around the island have opened their air-conditioned facilities to provide respite to residents. Companies have also allowed their employees to work from home, in order to minimise their exposure to the air-borne pollutants. What should we do when life gives us lemons – or smelly haze? Are there lessons that we can learn from the haze? As a little red dot, Singapore is vulnerable to the activities and actions which take place in our larger neighbours. While our Government has offered our help and exerted their influence on Indonesia to quell the emergency situation, we can’t physically put the fires out ourselves. Reading the news about fire fighting efforts in Indonesia, we have also seen that the country itself is experiencing tremendous challenges trying to extinguish the flames and its noxious fumes. The PSI have reached stratospheric levels of over 900 to as high as 1,900 in certain cities in Sumatra and Kalimantan, with many Indonesians suffering from its ill effects. In the same way, we may face external challenges in life that we have no control over. While we should certainly find ways to minimise these externalities, there is a physical limit to what can be done. After we have done whatever we could, the best thing we could do is to surrender it in God’s hands. Have you noticed how efficient and quick Singapore’s responses to the haze have been this time around? Unlike the previous situation back in 2013, none of the shops ran out of N95 masks or air purifiers. In fact, my wife and I just ordered an air purifier unit ourselves, and it arrived very quickly in just 2 to 3 days. Likewise, it behooves us to make adequate preparations in our life to cater for any calamities. This could be anything from health scares to job losses to financial challenges. By catering for emergencies, we are better prepared to ride the storms should they arrive. In a calamity like this, the best way to manage the situation is to address the problem in a calm, collected and comprehensive manner. This entails the need for all parties involved to study the root cause of the disaster, develop a plan for action, and work cohesively to address it. Admittedly, I was one of those who complained about the haze when it occurred. After some time, I realise that it is more fruitful to share helpful information rather than point accusatory fingers at any one party involved or to get angry over something that I have little control over. I believe that there is already action taken at the highest levels to curtail the ill effects of the haze. Let us all hope that we can reach a suitable and equitable solution. In life, it is inevitable that occasional problems will come our way. Rather than focus our energies on complaining, blaming or shaming, it may perhaps be more productive to work on addressing the issue at its root. When we have exhausted all the possibilities, and the issue still persists, it may be better for us to adapt to the “new normal” and change our lifestyles to suit the circumstances rather than ceaselessly belabour the point. As I sit here in the library typing out this short piece, the Sun has started shining once again. It appeared as if the haze has magically disappeared over night. I suppose that this sudden change could be due to the change in the wind direction. People are walking about in the streets again, birds are singing in the trees, and the overall mood has improved. Hopeful this respite from the overwhelming haze is a long-term rather than a brief one. In a similar fashion, problems are never permanent. While we may feel aggrieved and afflicted when calamities hit us, we must remember that they are just temporary blips in the landscape. Sooner or later the winds of change will blow those dark clouds away. When that happens, we should adapt quickly so that we can get back to living a normal life as soon as possible. Update at 4.17 pm: Unfortunately, the respite didn’t last very long. However, we should take heart that the haze wouldn’t last forever. Last, but certainly not least, we should look at the bright side of disasters and calamities. When I reflect on how Singaporeans have reached out to each other and help one another during a crisis like the haze, my heart grew as warm as the Sun. I have witnessed people offering their masks to strangers or sharing the latest information on the haze with each other. Different people respond to crises in different ways. For some, it brings out negative behaviours and uncivic responses. Thankfully, we have seen in this episode that the haze has united Singaporeans and spurred us to extend a helping hand to others who are in greater need. This is the exact neighbourly spirit that we should practice – not only during national emergencies, but in all other times. 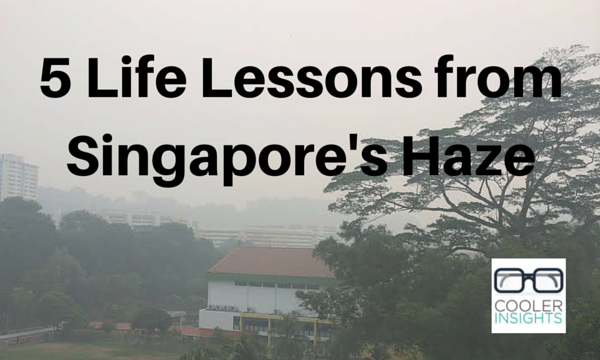 What other lessons can we learn from the haze? I’d love to hear your thoughts.